Custom hydraulic equipment tailor made for the needs of your business can make a huge difference in your productivity and profits. 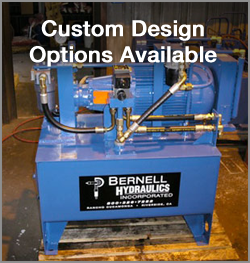 If you’ve been dreaming of a new, custom system of your very own, Bernell Hydraulics can help. We handle jobs large and small so we can help you create all the custom hydraulic systems in Corona CA you may need. At Bernell Hydraulics, we offer full-service design and manufacturing for custom hydraulic systems in Corona CA. No matter what the parameters of your project may be, we can help you create the machinery you need. Bring us your schematics or let our engineering team design your custom system from scratch. Either way you are assured of expert workmanship using the highest-quality parts and materials. If pre-made parts won’t work for your design, we will build them ourselves. Even if we didn’t create your custom hydraulic system, we are happy to service it. We can help you with everything from replacing fluids, hoses, and filters to creating new rods, tubes, or cylinders. If you’re having recurring maintenance issues with a custom system built by another company, you might want to consider letting our team of highly skilled technicians take a look. We have the engineering expertise needed to determine if a design flaw is causing your performance issues. If that is the case, we can help you draft a new, more efficient design and then create the custom parts needed to implement that design and upgrade your system. When you choose Bernell Hydraulics, you know that your investment in custom hydraulic systems in Corona CA will be carried out with the utmost care and respect. Our custom design and manufacturing departments are staffed with experts who know how to get the job done right the first time.